Cardiac Ultrasound Laboratory. Massachusetts General Hospita Fig. 6. (A) Left ventricle dimensions (parasternal long-axis [PLAX] measurements). 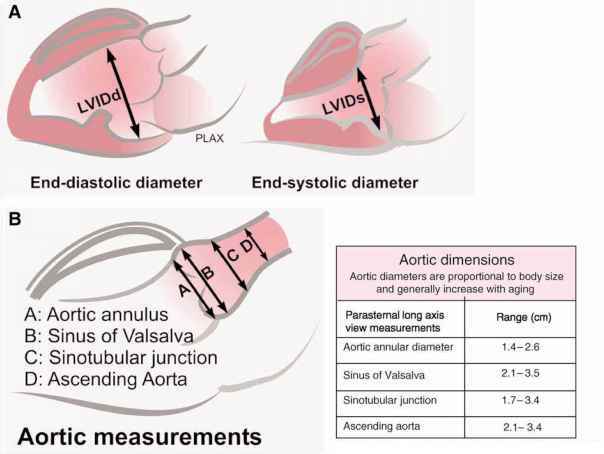 (B) Dimensions of the aorta (PLAX measurements). Fig. 7. 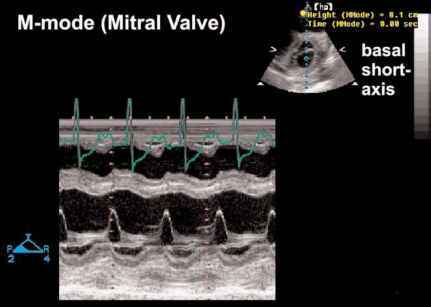 M-mode showing premature diastolic closure of the mitral valve—a reflection of the hemodynamic impact of aortic regurgitation on the left ventricle. Other M-mode signs include anterior mitral valve leaflet fluttering (and less commonly, septal diastolic fluttering). Fig. 8. 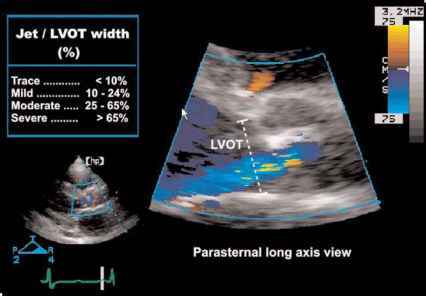 Ratio of the aortic jet width (diameter) to left ventricular outflow tract (LVOT) diameter. 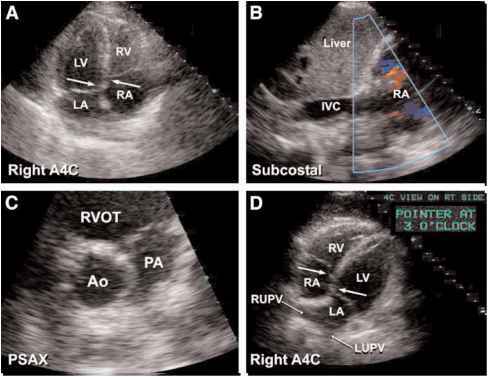 The diameter of the color jet is measured immediately beneath the aortic valve is a semi-quantitative index of aortic regurgitation severity. width is not related to the degree of regurgitation. The ratio of jet diameter to left ventricular outflow tract diameter can be calculated (Fig. 9). 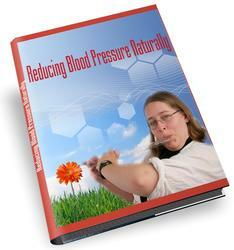 This ratio can provide a semi-quantitative estimate of the degree of regurgitation: less than 10%, trace; 10-24%, mild; 25-65%, moderate; and greater than 65%, severe.